Brook vs. Berto: Isn’t this a step too far for Kell? By Scott Gilfoid: After Kell Brook defeated Rafal Jackiewicz by a 6th round TKO last night, Brook’s promoter Eddie Hearn was already dreaming up Brook’s future fights for 2012, saying that he wants Brook to fight in December 17th against TBA on the undercard of Carl Froch – Andre Ward. And then he wants Brook to fight either IBF welterweight champion Andre Berto or Amir Khan. You can immediately cross Khan off Brook’s list for 2012, and likely 2013 to 2014, because he showed some power in taking out Jackiewicz. That right there likely removes any chance of Brook getting a fight against Khan because he’s not matched against guys with power nowadays unless he absolutely has to at the risk of having his title stripped from him. This leaves only Berto, who has much better hand speed and power compared to Brook. I liked some of the things that Brook did last night in fighting in close, his movements around the ring and his use of his jab. However, Berto is a completely different fighter than the stationary, slow-handed Jackiewicz. I can see this being a step too far for Brook to take and it could lead to him getting knocked out and/or beaten up. There are much softer targets out there for Brook to beat than Berto. With the soft matchmaking that Brook has been brought up on during his eight year pro career, it wouldn’t be wise to go from pure softness to a guy can actually fight in Berto. That would be disastrous for Brook right now. He needs to slowly work up to the level of Berto by having Brook fight some contender that can actually fight and not just stand around soaking up punishment all night long the way that Jackiewicz did. 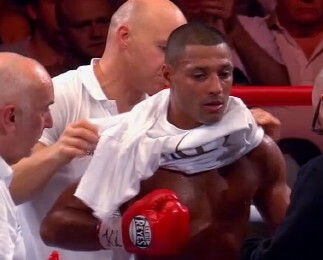 Boxing » Andre Berto » Brook vs. Berto: Isn’t this a step too far for Kell?